It is a sub-routine calls that given by the microcontroller when some other program with high priority is request for acquiring the system buses than interrupt occur in current running program. The timer and serial interrupts are internally produced by the microcontroller, whereas the external interrupts are produced by additional interfacing devices or switches that are externally connected with the microcontroller. These external interrupts can be level triggered or edge triggered. When interrupt occur then the microcontroller executes the interrupt service routine. Therefore the memory location corresponds to interrupt enables it. 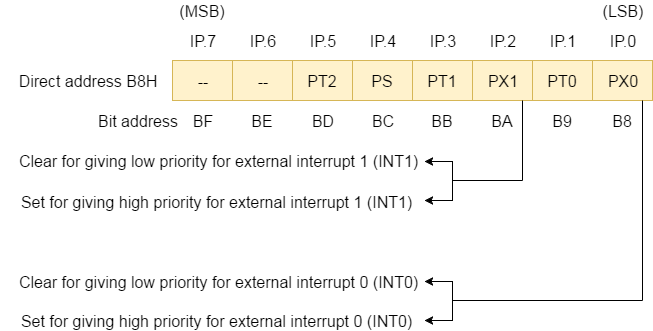 Consider the interrupt corresponding to the memory location is shown in the interrupt vector table below. 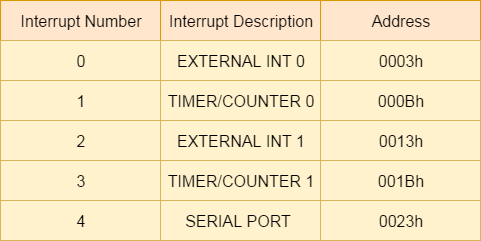 All the interrupts can be set or cleared by some special function register that is also known as interrupt enabled (IE), and it is totally depends on the priority, which is executed by using interrupt priority register. IE register is used for enabling and disabling the interrupt. 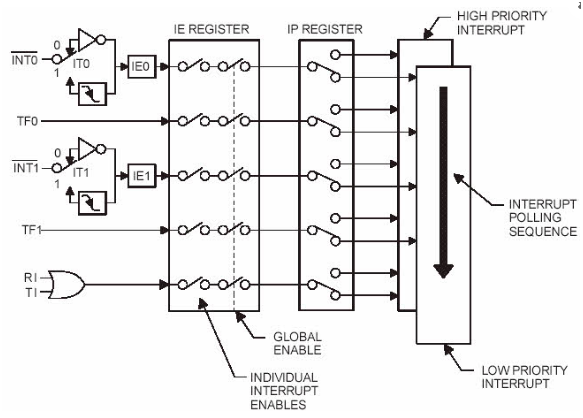 This is a bit addressable register in which EA value must be set to one for enabling interrupts. The individual bits in this register enables the particular interrupt like timer, serial and external inputs. 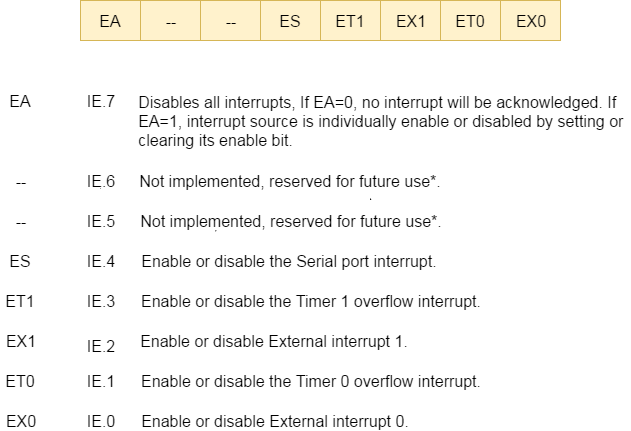 Consider in the below IE register, bit corresponds to 1 activate the interrupt and 0 disable the interrupt. Using IP register it is possible to change the priority levels of an interrupts by clearing or setting the individual bit in the Interrupt priority (IP) register as shown in figure. It allows the low priority interrupt can interrupt the high-priority interrupt, but it prohibits the interruption by using another low-priority interrupt. If the priorities of interrupt are not programmed, then microcontroller executes the instruction in a predefined manner and its order are INT0, TF0, INT1, TF1, and SI. Selecting the configuration of TMOD register and their mode of operation. Enables the IE registers and corresponding timer bits in it. Choose and load the initial values of TLx and THx by using appropriate mode of operation. Set the timer run bit for starting the timer. Write the subroutine for a timer and clears the value of TRx at the end of the subroutine. Microcontroller 8051 is consisting of two external hardware interrupts: INT0 and INT1 as discussed above. These interrupts are enabled at pin 3.2 and pin 3.3. It can be level triggered or edge triggered. In level triggering, low signal at pin 3.2 enables the interrupt, while at pin 3.2 high to low transition enables the edge triggered interrupt. Enables the equivalent bit of external interrupt in Interrupt Enable (IE) register. If it is level triggering, then write subroutine appropriate to this interrupt, or else enable the bit in TCON register corresponding to the edge triggered interrupt. Configure the Interrupt Enable register for enabling serial interrupt. Configure the SCON register for performing transferring and receiving operation. Write a subroutine for given interrupt with appropriate function.